In Canada, a patient needs blood every minute of every day. In the U.S., five million patients will need blood this year. 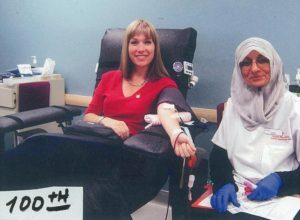 Impark’s director of customer service, Barb Mount, realized there’s power in numbers when it comes to blood donation. Already a champion of blood donation herself, Barb has coordinated group blood drives for Impark’s Vancouver employees for the past seven years, representing over 300 units of blood collected from members of multiple Impark subsidiaries and departments. Barb donating her 100th unit of blood. Well done, Barb! Barb — who recently made her 100th blood donation — partners with Canadian Blood Services to set an annual donation goal and then schedules quarterly group blood drivers timed to the minimum required days between donations. Collectively, Impark employees in Vancouver have generously donated up to 50 units every year, often surpassing their annual pledge. Assign a branch or regional coordinator. Connect with your local blood donation agency. Set a pledge or goal for your office or region. This will act as a great motivator! Publicize the drive via email and/or posters. This will help reduce fear by explaining what’s involved. Be sure to include links and resources in case anyone has specific medical questions. People who have personal or confidential questions about eligibility should be referred to your blood donation agency. Send out a reminder. Confirm donor appointments prior to the blood drive. Follow up with your donation representative at the blood donation agency to confirm the donor list and any last minute details. Written by Neera Dhingra, an Impark HR Coordinator based in Vancouver.